If you want the fastest turnaround for the installation of cold rooms, from your initial enquiry, through to on-site delivery, then we are happy to rise to that challenge. We’re proud to act as agents for Porkka, the largest supplier of modular cold rooms in Europe, which puts us in prime position to continue on our quest to offer you an outstanding service and make sure that your cold room systems work correctly from day one (an ambitious aim, we know, but one we’re confident we can live up to). But here at ACL Refrigeration & Air Conditioning, we’re not a one-trick pony: aside from our skills with Porkka cold rooms, we’re also pretty nifty with Williams, Foster, Gram and Caravell units. Because we understand that we have to be adaptable enough to fit in with your needs, we also offer service and maintenance packages which can be provided on a pay-as-you-go basis as and when your need us, or on more structured fixed monthly or annual contracts. We really are that flexible. For those on a really tight budget (and let’s face it, these days who isn’t?) 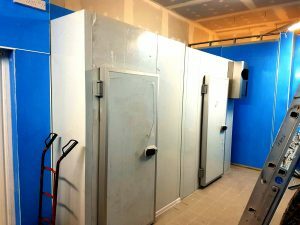 we also supply refurbished cold rooms and cold stores at a fraction of the cost of new. Keep an eye open and check back regularly, as new stock comes and goes daily.